Jerry Seinfeld has taken everything we know about talk shows and brought them out to the streets. His web show, which is coming soon to Netflix after previously being exclusive to Crackle, is designed to let viewers feel like a fly on the wall while Seinfeld and a variety of comedian guests have one on one conversations about life, comedy and whatever else pops into their head. 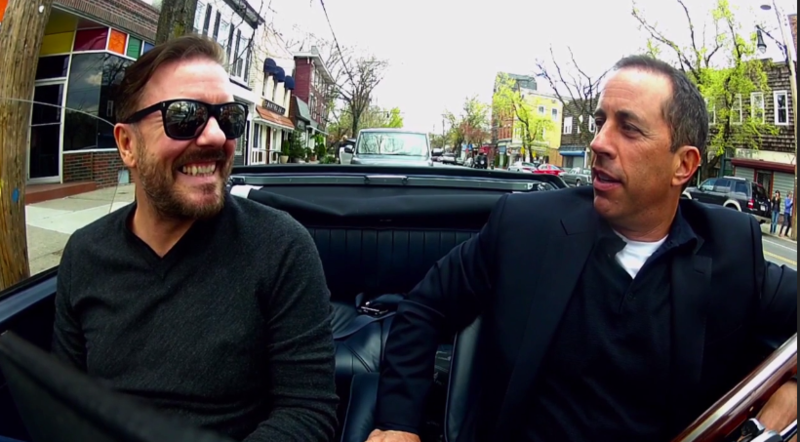 Seinfeld picks a classic vehicle that he feels best fits the personality of the guest (it’s often a stretch, but a fun gimmick) and takes them to a nearby coffee shop to learn what makes them tick. In time he’s moved past inviting only comedians, but that’s still its foundation. It’s been nominated for an Emmy in the “Best Varity Talk Series” category, and the show has become a cult hit among the comedy community. With the show about to available to a wider audience than ever, it seemed like the perfect time to sit down and rank all 59 episodes that have aired throughout its nine seasons. Gervais knows how to be funny, but it’s hard for him to put on a face that he cares being on this show. The awkward pacing of this episode could be attributed to the fact that it was one of the very first episodes, but it’s one to skip nonetheless. The introduction prepares us for the dry personality that is Mr. Todd Barry. Normally I like that, but his tastes might be a tad too dry for this type of show. Taking part in a conversation with a mellow guy is one thing, watching it is a drag. Ali Wentworth seems like a delightful person, but too much of this episode is centered on her being “WASPY” (a term used to describe powerful, rich and preppy). This episode is less about her comedic process and more about how much money she has. They even veer off to buy her a silk scarf. I understand the purpose here. Find a guest who isn’t one of Jerry’s good pals and put them in a car with him to mix things up. I respect that in theory. But picking Miranda Sings (actual name Colleen Ballinger) ended up being a gigantic gamble that ultimately misfired. The lack of chemistry is palpable throughout the entire twenty-minute runtime. A great one on one that forgets to be funny. Joel Hodgson, creator of Mystery Science Theater 3000, feels as though he’d make a better philosopher than he does a comic. Hodgson is no doubt a smart man, but the comedy in this is limited. Like Miranda Sings, I understand the creative reasoning behind putting Waltz in the passenger seat. But even this classy, two-time Oscar winning actor can’t seem to act enthused about spending the morning inside an IHOP with Seinfeld. Banter is one thing, bickering is another. Most of what this episode is comes off as Stern not having a good time. I know most of what comes out of Stern is complete sarcasm, but a large percentage of the time spent together is off putting. He’s apparently called “The Jerry Seinfeld of France.” Personally, I don’t see it, but it’s a nice title to have. The episode plays like a check list of all the French type things Jerry attempts to make his guest feel more at home, but most of them don’t end up landing. This one’s clearly for the Seinfeld fan in all of us. A short, but serviceable episode that aired during Super Bowl XLVIII where Jason Alexander, Wayne Knight and even Jerry get into their old Seinfeld characters. It’s a solid reunion, but that’s about it. Here is an episode of no real substance. It has an incredibly short runtime (a little under 8 minutes), and the entire conversation is full of observational one-liners that fall flat. People seem to be rather hot or cold on Schumer lately. The episode is pleasant enough and the conversation heads in some spirited directions, but it never gets down to the nuts and bolts of what makes her tick as a comedian. The only episode that feels uneven when Jerry interviews two people at once. The meat of the episode seems to sit on the shoulders of Madigan, while Martin feels like an awkward third wheel hanging out in the background. I’d be interested to see how they work together in their act, because it doesn’t work here. There’s an art to observational humor that Jerry has mastered. When Burr does it, it comes off as complaining. While that’s fine in his stand-up, here it feels like a road trip with your annoying relative. Even still, there’s an attitude about him that attracts your attention. I’ll cut it some slack for being the very first episode, where the show was still searching for an identity. We all know these two are hysterical individuals and make anything sound funny, but all the episode does is meander. It’s impossible for Cedric not to entertain. Even before he was a comedian, he worked at State Farm where comedy fell into his lap after a friend entered him into a comedy competition. He really gets into the details of comedic methods he’s learned over the years. The two shoot the breeze about struggles from past shows they’ve performed and the superiority of clean comedy vs. dirty comedy. You get the sense that Norm is a man of many stories, and for better or worse, could talk your ear off about anything. Switching things up as bit, Jerry takes a giant tour bus out to Boston just to meet with Aziz during one of his tours. Most of the first half is Jerry trying to get from point A to Point B without crashing. But along the way, Ansari talks about his upbringing. Nobody shows off confidence like JB Smoove. He even admits to being a fan of himself saying “you gotta be a fan!” He’s proven himself to be a great supporting actor in comedies, but in this show, you get to see more and more of his charm. Coffee is probably the last thing Lewis Black needs. Just give him a newspaper and he’ll get hyped up on the crazy happenings of the world. His angry trademark works in big settings while performing, but in a closed off car, he’s able to calm down a bit and relax. This is episode is at it’s best when everybody involved is in the same room. Once Mario Joyner joins in about halfway through, the conversation kicks into high gear with these guys bouncing off each other like old friends. It just takes a little while to get there. Being a sports car enthusiast himself, as well as a comedian, Leno has a ton to say. This is a particularly good episode to watch for any new comic wondering what it was like to perform on The Tonight Show, or any of the late night shows, for the very first time. 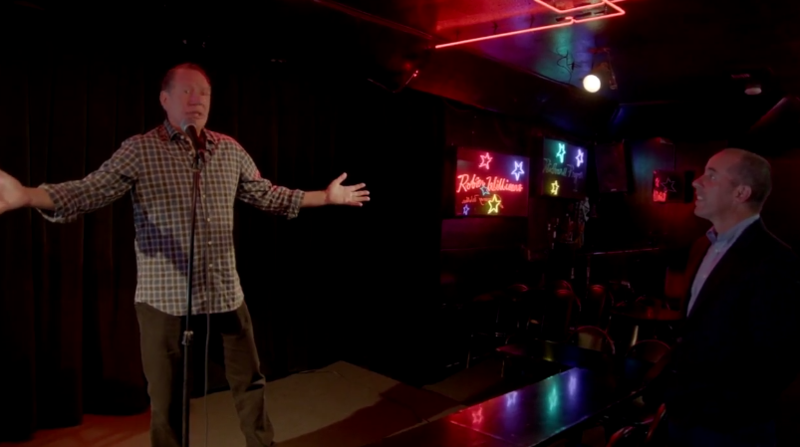 Stage fright was something that almost kept Jim Gaffigan from doing comedy. But chasing that buzz of changing stranger’s moods got him up there. Spending even a little bit of time with him shows how normal of a guy he is, which is inspiring for those wanting to pursue it. Hart is a force of nature—which is why Jerry chose a racecar to drive him around in. Driving in a car this loud makes for some hilarious back-and-forth between the two, but it’s over coffee where Hart gets into the real mechanics of his act. The people that have been on Saturday Night Live as long as Meyers was always have the best stories to share. He dishes to Jerry about what it’s like to tell somebody they got a job on the show and the two reminisce about the doing a Weekend Update segment together. If there were a Mount Rushmore of comedy, there’s no way that the late Don Rickles wouldn’t have his face on it. Rickles is full of comedic history and expresses that on this episode. With everything coming out of his mouth being a bit, it can be difficult to keep up. Alec Baldwin has the ability to take control of the situation, no matter what it is. He just has that type of big personality. While these aren’t traditional interviews, he undoubtedly takes over with his Burt Lancaster story and his tuna sandwich drama. Parents seem to be a big part of Silverman’s life, which is why she spends so much of this episode talking about them. She also opens up about depression, which not many guests on this show do. Being an open book is what makes her as good as she is. In between his run on The Colbert Report and his new gig hosting The Late Show, Stephen Colbert had a big ol’ grey beard known as “The Colbeard.” Colbert looks back on the time well spent at his old show, and his days auditioning in Chicago. Regan and Seinfeld are two very similar comedians in terms of what they are interested in talking about. So much so, that they even discuss a similar bit they had with the same idea, but slightly different lines. They seem to get each other, and the result is great. Calling these two comedy legends would be one of the biggest understatements of the century. An afternoon with these gentlemen ends up comparing to a solid time with your grandparents, with ld stories about “the good ol’ days” complete with chuckles. Maniscalco opens up by saying “when you see the world the world sees you,” and lately a whole lot of eyes have been on him. He’s a comedian that takes precious care of every little detail. Even the little spoons he uses at dinner parties have a purpose. In the episode, Jerry travels to Armisen’s natural habitat of Portland and describes him has “an exotic bird kind of guy.” In many ways this is true. Armisen’s brand of comedy is beyond the norm of what most other comedians do, and this episode gives a brief insight as to why and how that is. An episode so packed that it had to be split into two parts. But did it though? One episode is Jerry finding a location to detach his boat, but the meatier of the two does what Fallon fans want by providing a healthy dose of smiles. The content is like a timeline of Fallon’s life, discussing his SNL days to his current Tonight Show ones. I mentioned earlier in the list that Howard Stern’s sarcasm came off as mean spirited. But Bob Einstein finds a way to be completely sarcastic in a fun and silly way. The bit where Einstein actually leaves the car mid-episode is one of the show’s funniest moments. 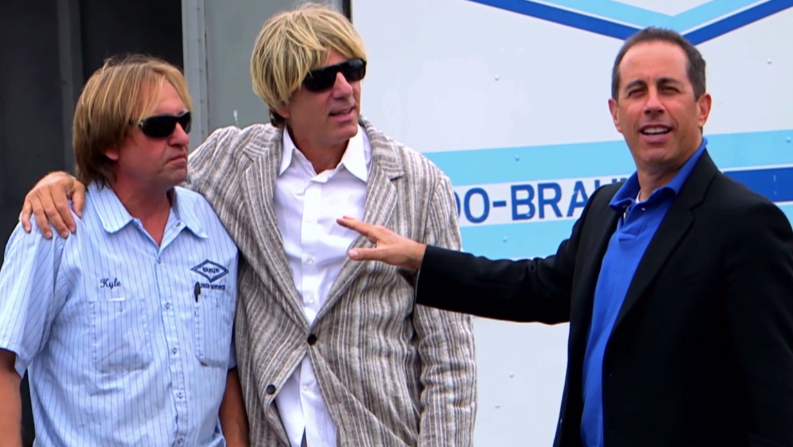 This Bob Einstein episode is even more entertaining than the last. Jerry adds a whole “will he, won’t he” element about giving him his brand new Acura as a gift if the interview goes well. There’s a reason Einstein is Jerry’s first repeat guest in the series. 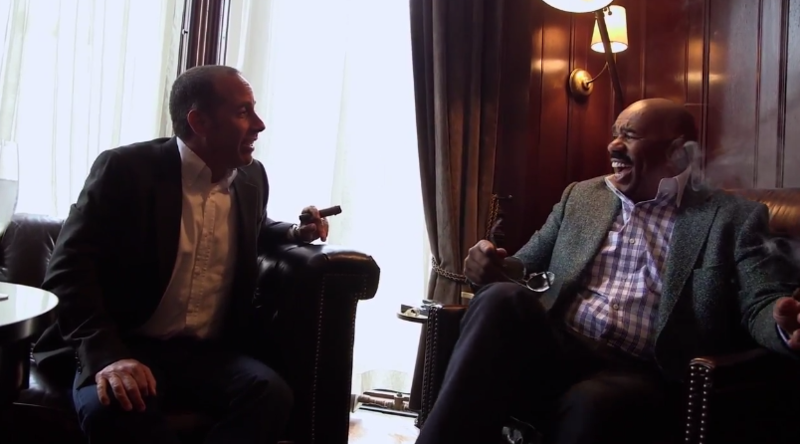 I’m admittedly not the biggest Steve Harvey fan, but listening to Jerry talk about what makes Harvey a good comedian made me want to reconsider that thought. The two talk about the break down of jokes and how it’s impossible to teach a comedy class. I’m convinced Patton Oswalt could sell anything to anyone. He speaks so passionately about any and all topics that he can draw you in with any sort of fact or story. Which comes in handy when dealing with a broken down DeLorean and describing favorite downtown locations. All it takes to get David Letterman to open up about noteworthy Late Show stories is a bag of freshly popped kettle corn. Like Leno’s episode, Letterman thinks back on specific Late Show moments that stick out to him. Jerry comes off super engaged, and as a result, so are we. Anyone who has ever watched Real Time With Bill Maher knows he can be a little much. But this episode shows us a different side to Maher—a gentler side. So much so that Jerry seems like the darker of the two when chatting about dying ‘70s rock stars. A lot of comedians today owe their careers to Lorne Michaels for giving them their big break on SNL. Nobody has more insightful things to say about performing live comedy than him. Even if he isn’t a comedian himself, he respects the art all the same. You may still hate him for his offensive comments on stage years ago, but that’s all the more reason to check out this episode. Richards takes the time he has to show vulnerability and share with Jerry what he felt that night and how he has continued feeling since. It’s undeniably touching. Margaret Cho uses her unique voice to address darker issues. She is a survivor of sexual abuse, and talks about that a lot in her act, which according to her, upsets people. But it’s this personal side of her comedy that drew Jerry to her in the first place. With Rock, it’s all about the company you surround yourself with. He says that even a hot dog with an interesting person is a good time, which is actually what you get when spending this episode with Rock: a good time with an interesting man. Any opportunity you can get to watch the great Tina Fey try a strange wheat puff milkshake, you take it! Prepare to be inspired listening to Fey talk about her ambitions and goals, even after she’s accomplished so much already. Even on a bleak rainy day, like the one featured here, John Oliver can be a shiny bright light. He isn’t afraid to talk in depth about times he’s bombed on stage or said the wrong thing about his wife on TV. In getting personal, he explains the important internal logic of comedy. A history lesson in the South Africa comedy scene. 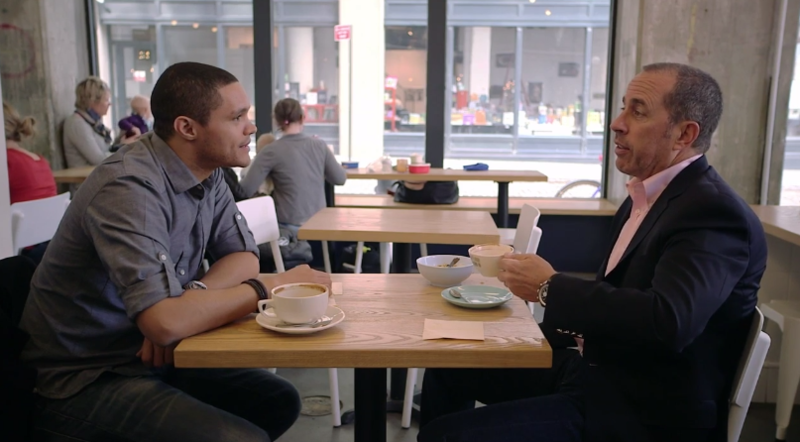 Trevor Noah shares his personal journey that no other comedian on the show can replicate. It helps that Jerry seems interested and fully invested in Trevor’s stories, as anybody who watches this episode will be. Not a friend, not a stranger, but instead a personal hero of Jerry’s. Robert Klein started a whole new wave of stand-up comedy in the 1960s and we now get to hear all about. After a tour through his home, Klein might just become one of your favorites too. Ever wanted to hear Jerry sing a musical bit? Of course you did, and with this episode you can! Not only that, but Parker’s bubbly personality practically leaps off the screen. If guest enthusiasm were a competition, she would crush just about everyone. Pre-Daily Show Stewart is not one that we’re all familiar with, but it’s a fascinating part of his career none the less. The two get into the details of how Stewart found his voice in the political satire scene, and how their work schedule fits the natural rhythms of doing comedy. Delightful is a word that comes to mind when watching this episode. It’s not because of the quaint little bookstore they walk into, but because of Wiig herself. She’s a natural conversationalist full of interesting stories about her start in LA and her early SNL days. Will Ferrell is somebody who can be funny in even the most simplistic of situations. He’s introduced by playing on a swing set like a young child and it’s impossible not to be won over. You’ll get to learn all about his SNL audition, which I would have paid anything to have been in the room for. Stand-up legend George Wallace is overflowing with energy here. He’ll start a conversation with anybody and will even shout questions in a crowded room for a laugh. We also get to see the backstage lead up to one of his performances, where even Jerry gets in on the action. In another life, former President Barack Obama probably could have been a successful comedian. He has the delivery down and laid back sense of humor that people feel at ease listening to. Getting an exclusive tour of The White House is reason enough to put this episode of your radar. I miss Jim Carrey, you miss Jim Carrey, we all miss Jim Carrey. The old Jim Carrey, anyway. It’s been a long time since Carrey made a movie that made us cry with laughter like his mid-’90s work did. While this is only a fun sized return, it’s better than nothing. It’ll make you fall in love with his crazy antics all over again. Jerry and Louis-Dreyfus are such close friends that they practically finish each other’s sentences. They spend most of the time reminiscing about old Seinfeld inside jokes, as one would expect. It plays out like old friends who haven’t seen each other since college going “remember this, remember that!” For the Seinfeld enthusiasts, this is pure gold. The fact that this episode aired only two months before Shandling’s tragic death and the title of it is “It’s Great That Garry Shandling s Still Alive” is freaky. But get past the coincidence, and you’ll find yourself on a comedic ride through the famous Comedy Store while hearing old Tonight Show stories. Anyone who has watched even one of C.K.’s stand-up specials knows he is a master storyteller, and this episode is further proof. The story he tells about his boat being stuck at sea is just as good as anything he’s told on stage. Equal parts hilarious and insightful to watch. Despite an awkward broken down car moment, this is one of those episodes that defines the show. Jerry takes an in-depth journey down the rabbit hole that is Martin’s historic career, covering everything from comedic timing, bombing on stage and feeling free while performing. The best, most well rounded episode is the one with the biggest comedy nerd to appear on the show. 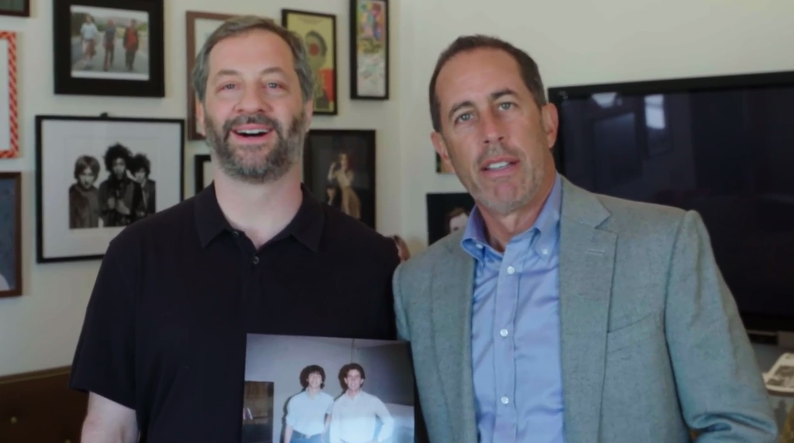 Judd Apatow talks comedy like your jock college roommate would talk sports. He shows off his comedic memorabilia, explains why he returned to stand-up, and talks about their dear friend Garry Shandling. Christian Becker is a writer and improv comedy performer in New York City. Follow him on Twitter @TheAmazingBeck.